StudioPress Sites are a all-in-one WordPress Solution (by RainMaker Digital Pvt. Ltd) you need to run your online business. StudioPress Sites includes managed hosting, 20 mobile responsive WordPress Themes, premium plugins like beaver page builder, optin monster and advanced SEO and world class support. Coming with a price range of $24-$33 per month, StudioPress Sites equip you with everything you need to run a content-oriented blog or a eCommerce business on WordPress under one hood. Try it if you want to grow your business and focus only on the growth aspect rather than site and hosting hassles. StudioPress owners just released StudioPress Sites, a new venture that takes the headache off your online business. 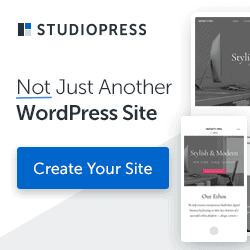 If you are anywhere into blogging/website building you probably know that StudioPress is the company behind largest selling premium WordPress themes. Their are the makers of Genesis framework and are the brainchild of Copyblogger Media. Copyblogger Media also are the makers of Rainmaker Digital that are a complete solution for small business & content marketers worldwide. In this article, we’ll have a quick StudioPress Sites Review and see if they’re worth trying out! StudioPress Sites Review 2018: All-in-one Hosting & Website Builder Tools? What Does StudioPress Sites Include? Who is StudioPress sites not for? Who Should Use StudioPress Sites? 1) Cost of StudioPress Sites an Issue? Wrapping Up StudioPress Sites Review: Is StudioPress Sites Worth The Money? Coming with a price range of $24-$33 per month, StudioPress Sites equip you with everything you need to run a content-oriented blog or a eCommerce business on WordPress under one hood. Let’s have a complete review of whats included and what not including pros and cons. In this article, we’ll have a thorough StudioPress Sites Review, which is a brand new all in one website builder with everything you need to run an online business under one hood with the flexible power of WordPress. StudioPress Sites is the product of RainMaker Digital and is essentially an improved version of WordPress that gives you more the best of WordPress minus the hassles of self-hosted websites. StudioPress Sites package comes with inbuilt mobile optimized themes, hosting support, eCommerce facility and world class support. Curious to know more about StudioPress Sites? What StudioPress Sites are? Who is StudioPress Sites for and what does it offer? Is StudioPress sites a better solution than self-hosted WordPress sites and if you should you be interested in it? Moreover, let’s discuss if StudioPress Sites are worth your time. Someone who can manage the hassles of self-hosted sites. Affiliate marketers and bloggers who want to focus more on conversions that site hassles. Now that they claim StudioPress sites as a better solution/alternative to self hosted WordPress sites, let’s have a quick comparison of StudioPress Sites vs Self-hosted WordPress sites. We’ll also have a quick feature overview of StudioPress Sites and see what they offer. StudioPress sites are basically WordPress sites, running on WordPress platform at the core, but they are modified to include everything one needs to run a WordPress website (all in one place). With StudioPress Sites, you do not have to undergo the hassles of choosing a web hosting for your website, rather is has inbuilt super powerful WordPress hosting under the hood. They offer much more than hosting alone, one-click plugin and theme installs, managing digital store everything inside the package. With StudioPress sites, you get access to the Genesis framework and 20 beautiful mobile responsive genesis child themes that you can use for your websites. Genesis Framework reviews all prove that they are super fast, cleanly coded WordPress themes with rock-solid security at the core. The genesis child themes are individual customizable themes that one uses along with the framework. All included Genesis child themes are ads optimized WordPress Themes, HTML5 and mobile responsive and commerce enabled. With, StudioPress Sites you get 20 different mobile responsive themes to match your branding and conversion goals. All these themes are not restricted to use as-is. You can customize and even if you have an existing genesis theme or branded customized Genesis child theme you can use it as well. With StudioPress Sites, you get a range of premium plugins and marketing tools included in the package for free. Here is a list of plugins and a close sneak peek of the plugin interface of the StudioPress Sites dashboard. You get a page builder plugin (beaver plugin) to customize layout and designs of your site using the drag & drop interface. You have OptinMonster plugin do leverage all your email marketing campaigns. Other notable plugins include WPForms plugin, Genesis Design Pallete Pro, Restrict Content Pro (for membership sites and premium product downloads), easy digital downloads, AMP plugin to make your site AMP optimized for better mobile performance. With self-hosted WordPress sites, you have no support. Sure you have support but not unified because WordPress itself isn’t one single product. You have to contact hosting support for hosting issues, I use thrive themes (on this site) so I contact them for issues with my theme (and they’re the best in support too) and same goes for any premium plugins I use. Again for hosting issues I contact my hosting provider, this is how things worked prior to launch of StudioPress Sites. Since StudioPress sites is an all in one website builder with everything you need to run an online business in the same package, you can contact the same support team for every issue. You got hosting issue, dial the same number, you got plugin issue contact them again and so on. Needless to say, StudioPress guys are well known for world class support. With StudioPress Sites, you get your own high-speed, WordPress-specific Cloud performance hosting. The best thing is that you don’t have to pay for sudden traffic spikes, increase in bandwidth consumption, CPUs or RAM. Everything’s included! All you high traffic guys out there, StudioPress Sites’s have got your back too! While most WordPress hosting providers simply shut your site or ask you for an upgrade when you get those high traffic spikes, StudioPress Sites’ Hosting never trades you for dimes and nickels. Once you get their package, you need not worry about traffic spikes or going viral. StudioPress themes are the most SEO friendly WordPress themes out there and so are StudioPress Sites. They are optimized to improve your Google rankings and come with settings optimized for search engines. Here is a review of Rebecca Gill, an expert consultant for WordPress users which shows she just loves the new StudioPress Sites’ SEO integration. StudioPress Sites are more secure than any other sites. Unlike Self-hosted WordPress blogs which are prone to hacks and malware attacks, StudioPress Sites come with enhanced levels of security which protects your online business from getting hacked/snatched. The fact that everything is from the same makers so they know all the loopholes and block them to keep you secure. Since, you are trusting world class experts, you get enough time to focus on your content or on your business and the growth aspect of it. The StudioPress Sites include everything from email marketing plugins to inbuilt landing pages, from podcast integration to forums and eCommerce integration everything is there right when you need it. You don’t need to get overwhelmed with all these features, they’ll all be there but under the hood until you need them. You dashboard will be clear of features you don’t need until you need them. This saves you an incredible amount of time and energy researching on various products, buying them. going through the various learning curve and what not. StudioPress Sites saves you of this horror so that you only focus on your content, on your business. 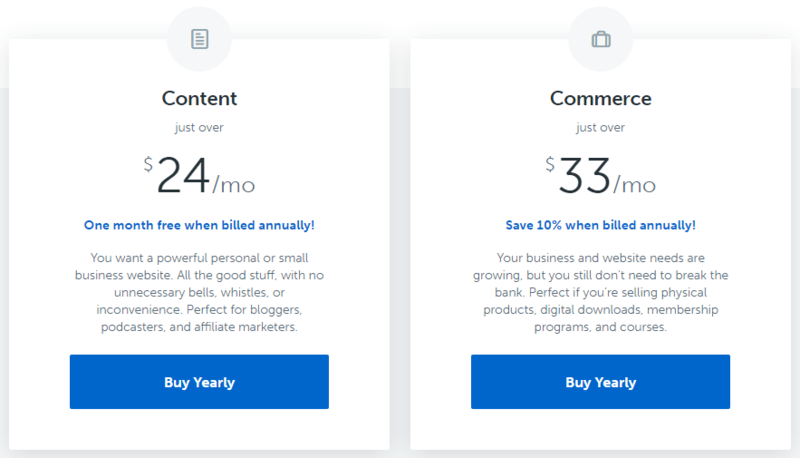 StudioPress comes with two pricing plans. One for content marketers (bloggers, affiliate marketers, podcasters and content creators) and the other for eCommerce owners (who got physical/digital products sellers or membership site owners). This is a reasonable plan because not all content owners will need commerce facilities. StudioPress Sites cost $24/month for content creators and $33 per month for commerce owners. Since I believe that true business starts after the purchase, the essence of any business I do depends on the customer service and after sales support they provide. StudioPress Sites are one of those excellent products that have a thriving community of happy fans around them. The team behind are known to be prompt to help their customers and leave alone the team, the community of StudioPress users are also huge resources ever ready to help other users. Since, they are not launched to the public yet, I can’t say the cons exactly but I can tell you for sure that is has obvious disadvantages over Self-hosted WordPress blogs. It is you who will decide if they are worth a try! StudioPress Sites aren’t going to be cheap in any way. They cost $24/month which is a bit more for regular users. With all that benefits of managed hosting, premium themes they are going to be costlier than their alternatives (self-hosted WordPress blogs). If you’re a regular blogger, you have the option to cut your costs by choosing a cheap web hosting for your blog or by cutting the budget with premium themes. You can also opt out for premium plugins and manage with free plugins. However, if you buy StudioPress Sites, you will be paying for all those mentioned above no matter you use them (or even need them). 20 premium SEO optimized & mobile responsive WordPress themes. So, you are basically saving a lot of money in the long run. StudioPress Sites are like walled garden, they are the best but do not give you a chance of peeking out. You most probably cannot use any plugin that you want and have to manage your tasks with what you get served. But then, that is why people buy iPhones, right? They know what is best and what can be beneficial for you and hence they’ve included all you need minus the clutter. I assume, you can expect a few bugs here and there since they are launching their version 1 now. It is quite natural and there is no wrong in this since everything evolves with time. You also get the extra benefits early on-boarders get. Special treatment, first-hand problem solving and decreased price are all you get when you choose them right when they are taking off. Should you go for WordPress self-hosted blogs or StudioPress sites? I don’t know! This is what you have to decide. StudioPress sites come with a price tag but are more secure, robust and they know what is best for you. Since they manage everything, you only get to focus on your business growth. This is very important for online bloggers and affiliate marketers. Same goes for eCommerce owners. If you’re selling something on a brick and mortar store wouldn’t you pay much much more only for the rent? StudioPress Sites, with $24/month, takes away every single hassle you’d have with your website thus you only got to solve your business and team hassles. This is very crucial for growth. However, if you are starting out or not earning much online, self-hosted WordPress blogs are a better bet. But if you have already passed the surviving phase and are now in the growth phase, I’d suggest you to try them out. StudioPress has discontinued their StudioPress Sites range after their merger with WPEngine. They now only offer StudioPress themes a a standalone product. Click here to know more about StudioPress themes. StudioPress Sites are a all-in-one WordPress Solution (by RainMaker Digital Pvt. Ltd) you need to run your online business. StudioPress Sites includes managed hosting, 20 mobile responsive WordPress Themes, premium plugins like beaver page builder, optin monster and advanced SEO and world class support. Coming with a price range of $24-$33 per month, StudioPress Sites equip you with everything you need to run a content-oriented blog or a eCommerce business on WordPress under one hood. Try it if you want to grow your business and focus only on the growth aspect rather than site and hosting hassles. I am not a newbie blogger. I am a busy blogger. So I think I should shift to stuidopress but kindly tell me if I shift to studio theme from my current WP theme, will this down my blog in terms of ranking? Bcz google will see it as a new website I think. I have under 90K Alexa ranking and I don’t want to lose it. Very interesting Review. I am a very big fan of Studio press. I am using Genesis framework right now and I am interested in their hosting plan as well. But I have one Question. Do they provide cPanel? or just an FTP to access the root folder for the website. I had not heard of this, so it was interesting to read about it. I would like to hear more on other’s experiences who actually use it. This sounds interesting! I need to check them out and will share this to my friends too! Glad to read your informative post. You have well described about StudioPress Sites and it will very beneficial for people to maximize their productivity level. You have really well catorgrized regarding studiopress sites – who can take advantage from it. It really sounds beneficial for content marketer and I want to take it trial. Eventually, thanks for sharing your worthy thought with us.